Kleefeld on Comics: Are Viewmaster Reels Comics? You remember Viewmaster, right? Big, red plastic binocular-looking things. 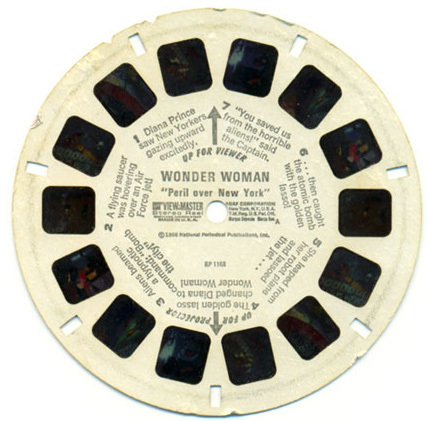 You'd put in a cardboard disc (called a "reel") with some pieces of film glued to it, and you could see the images in 3D when you looked through the eyepieces. Wildly popular toy in the 1960s and '70s when the company started selling licensed images on their reels. Previously, images tended to be more generic scenery and felt a bit like watching someone's vacation pictures. With the licensed properties, the reels were used to tell a story, generally based directly off the story the original images came from. You could get Star Trek, The Man from UNCLE, The Beverly Hillbillies, Peanuts... and, of course, superheroes. I had a several superhero sets as a kid. (Most of the reels, I still have, in fact!) Many are taken from the DC cartoons from Filmation in the 1960s. I had a few sets of Batman ones taken from the TV show starring Adam West. The plots of the stories were, obviously, insanely simplified -- as they tried to fit a half hour or hour story into three reels of seven images each. But why would I suggest they might be comics? Well, on each disc, as you can see from the image there had printed on it some text to accompany each image. Sometimes descriptions, sometimes dialogue. Frequently, though, the story would not hold up very well at all unless you read BOTH the images and the text. While they visually did not interact (though there were occasionally sound effects drawn onto the images) it was only by taking in both that the story unfolded. Furthermore, the text HAD to be in a specific location relative to the image to make sense. For example, in the disc shown above, the two images on the left and right sides of the reel are a pair that would display at the same time. But the text for that image is the upside-down caption that reads, "The golden lasso changed Diana to Wonder Woman!" If that text were moved to ANYWHERE else on the disc, it would not be read with the correct visual. Now, of course, this points back to the whole "what is the definition of comics" debate but it's an interesting consideration, I think, to look at Viewmaster reels in that light. If they don't qualify as comics -- which I suspect many people would argue -- why not? As much as traditional comic /books/ and graphic novels, newspaper strips, and webcomics can all fall under the canopy of "comics," then why can't the narrative Viewmaster reels be just as much of an innovation. I have very vague memories of my Viewmaster. Even after the lever broke I was perpetually confused as to why there were two of each image on the reels. The how behind stereoscopic 3D imagery eluded me well into elementary school. I think VM reels can be said to range from along a spectrum from comics to "illustrated story" to "series of vaguely-related images." Certainly some of the series based on cartoons (Flintstones, Bugs Bunny and Elmer, Roadrunner, and Woody Woodpecker) with 3-d modeling by Florence Thomas have some great moment-to-moment sequential "panels". I have a memory that some even have word balloons. This superman VM set is nice, too. Comics tend to be a unit of several images (eg a page of a comic book, or a complete newspaper strip) such that even when focussing on one image, we are peripherally aware of the entire unit; with Viewmaster reels we can only see one image at a time, removing this sense of unity. Therefore, I say that Viewmaster reels aren't comics. You can call them films if you like though, or even very, very, very limited animated stories. I used to collect comics. Now I collect 3D photography, including Viewmasters. This is an interesting question to ask and I have been thinking about it. Years ago, I read Scott McCloud's book, "Understanding Comics." In it, he talks about comics as being a form of "Sequential Art." I would agree that the story-telling Viewmasters are a form of sequential art in that they use images to tell a story. The educational and scenic reels do not tell a story, so they would not fall under the category of sequential art. But what makes a comic a comic? The story reels adapted from TV cartoons could just as easily been printed as a very short 21 panel comic book. These were generally made by converting the art to 3D. There are a limited number of levels of depth, which is why we usually complain about a "cardboard effect". This is why I prefer collecting the older story reels, such as the previously mentioned Florence Thomas reels. These displayed a full range of depth and were much more interesting to gaze at. But, should the cartoon reels be considered comics? Comic books have also been converted into 3D using similar techniques. The ones converted by Ray Zone are particularly well done. Photofunnies type books use photographs in a comic book form. So I suppose it could be argued that all story-telling reels fall under the comic category. But I doubt that we'll see VM reels regularly sold in comic book shops any time soon. I doubt that the majority of the comic book community would agree with this. I will attempt to contact Scott McCloud and ask him what he thinks. I won't hold my breath for an answer, but if I get lucky, I'll share his insight. I think this points up the fact that any kind of consistent, working definition of "comics" is for practical purposes impossible. Any definition will either be so narrow as to exclude things which lots of people think of as "comics" (e.g. one-panel cartoons) or else so broad as to include things which seem like they plainly do not belong (e.g. children's books, or even Viewmaster reels). I think the term is probably a bit like "vegetables," in that both have no formal definition as clearly-defined categories. They're just a shorthand for a set of things we associate together based on custom and intution. I realize you can’t respond to every email. But, as this is a thought provoking question. A response would be greatly appreciated. Are Viewmaster Reels Comics?..." Sure. Can be. Depends on the reel! With such an authority chiming in on the subject, I think it's fair to conclude that reels telling stories can be considered comics. Educational and travel related reels that do not tell a story, would not be comics. I think View-Master must be considered a destinctive form of art!! !It is not a comic more than an animatited movie is.View-Master is the art of telling a story through 7(or 21 per 3reel packet) carefully selected 3d pictures.The art of transfering emotions through its reels,like movies do through its films,comics through its drawings,photographs through its cuptures,books through its texts,scultures through its forms etc. View-Master is a medium -- photography -- and not an artistic mode like comics. Calling VM "comics" is like calling a tube of paint an "illustration."